As promised, here is a little insight into my evening yesterday. It was truly fab. Yesterday - Thursday 27th Feb - saw the publication of Sane New World in paperback - I KNOW - At last! If you haven't read this already (a) where have you been!? and (b) you can now read this masterpiece in a smallish compact and "easy to shove in your bag" paperback. Total bargain on Amazon too, especially if you think that dearest Rubes went to Oxford to write it. 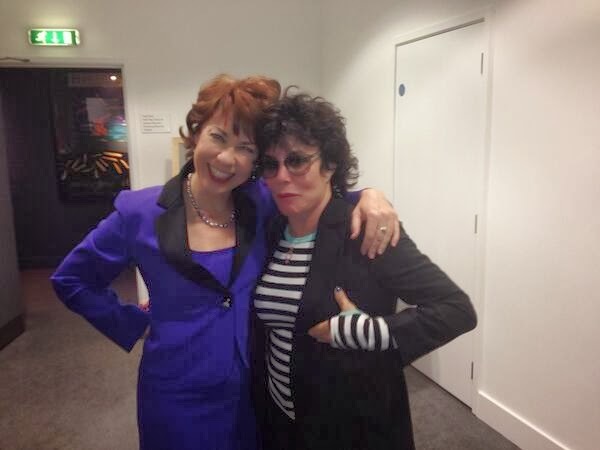 So I found myself at Jewish Book Week last night - Ruby was being interviewed by her hilarious and fun friend Kathy Lette. I had never met Kathy before but we had communicated via Twitter a lot and I had heard nothing but good things about her, so it was such a joy to meet her properly. Kathy's most recent book is also exceptional, by the way. Before the evening had even got started, I bumped into a family who were as lost and confused about where Kings Place was as me and when we discovered that we were all going to the same event, we got chatting and they asked me to join them for a glass of wine after I'd been to the book shop. Such generosity and friendliness from complete strangers - not something you see everyday, sadly. I promised to see them at the end to introduce them to Ruby but couldn't find them, which has left me feeling so sad as I would have loved to have seen them again. As you can imagine, I was so excited about the evening and these two superstars did not fail to disappoint..! Kathy's introduction was brilliant "Ruby shoots straight from the lip..."
They had the audience rocking with laughter... we heard about mindfulness, Ruby's time in the Priory (there's actually nothing funny about that), her scorpion tattoos, being replaced by Alan Yentob and recently being offered the job as the face of a cream to help with vaginal dryness - I kid you NOT (See here and here) and much else - I could have watched them chatting for hours. Spot the difference - people have been known to get them muddled up...! I can't think of a better tonic than spending my evening with these two very special people - such a boost after such a tricky few weeks. Just what I needed. On the eve of 1 March 2014, which will be four years to the day that I walked into Hospital to get well, I can't help but feel so unbelievably lucky to be where I am today and also be surrounded by such support from so many amazing people. There are, of course, still wobbles and days when one just wants to give up, but these are now outnumbered by many more positives - something I thought would never be possible - because as Ruby said last night, when you're in the depths of depression, you never think there will be a light at the end of the tunnel. But for now, there is, for both of us, and that is just fab. That's not to say that it won't come again - maybe it will tomorrow, maybe next month or next year. If it does, I'll be ready to fight - harder than ever. Just watch. I hope you are coming as Sane New World hits the road and is almost certainly coming to a theatre near you.. Don't miss out - I saw previews and it is fab. I am so lucky to be going twice. This time next week, I will have been to see it at Bishops Stortford and can hardly wait. PS I'm not going to apologise if my murmurs and mutterings bore you to death - the title of this blog allows me to mumble all I like. And there is no best way to shorten a post about an evening as amazing as this one.